Vector stock images by Aurielaki. Currency Money illustrations in EPS10 EPS JPG AI. Money currency vector illustration. Various money bills dollar cash paper bank notes and gold coins. 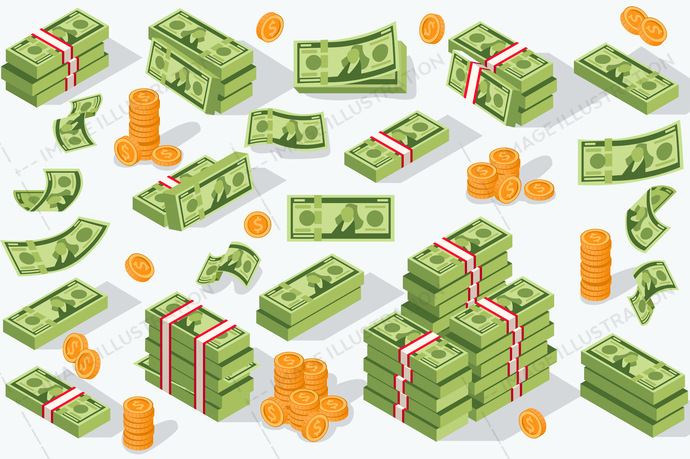 Collection of cash heap pile and currency stack vector set. SKU: Vector-Money-Currency-AurielAki. Category: Money Dollar Euro Vector. Tags: 3d, abstract, art, background, bank, banking, banknote, banner, bill, bitcoin, bundle, business, cash, coin, collection, currency, design, digital, dollar, economy, euro, finance, financial, flat, gold, golden, green, greenbacks, group, heap, icon, illustration, investment, isolated, jackpot, light, money, notes, object, pack, paper, pile, profit, rich, set, stack, success, symbol, vector, white.